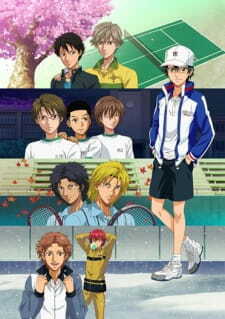 Episode 1: Shiraishi becomes the captain of Shitenhoji Tennis Club. In order to maintain the club, the members have to invite a new member. They try to attract Zaizen's attention by showing him jokes but Zaizen passes them off. Episode 2: Ryoma is told Seigaku's seven ghost stories by Momoshiro. They are quite common stories but the third grade members leave the club room in a hurry. Fuji says "It's time to confide this to you." and he begins to tell what he experienced two years ago. Story I rated an 8 since it really is not an addition to the main story it does touch on a few characters traits where you might have thought why does he do that, after watching you get that oh I see sort of feeling. The first episode was just funny to me. The other 3 touched on characters from other schools. Watch this if you liked the main story, you won't miss anything important if you head over to prince of tennis II. Art I gave an 8 same art as original story. Sound 8 leaves room for improving. Character 9 I love all the different personalities in this anime. Enjoyment 9 I rated the original anime a 10 this didn't have enough episodes to build excitement like the first series, these 4 are basically just add ons to the first 200 something episodes. Overall I rate this a 9. If you enjoyed the first couple hundred episodes why not watch these for before going into Prince of Tennis II. Hope this was helpful.